The standard procedure at Gemini is to use integrations comprised of 1000 frames of 60 msec each. The sensitivity to detecting point sources is dependent on the seeing, and all DSSI programs should request IQ70 conditions. Point source sensitivities have been estimated from Horch et al., (2012) and recommended integration times are listed in Table 1. The background detection sensitivity curve, relating the sensitivity to detect point sources as a function of distance from the primary target, has been calculated from the reconstructed images in Horch et al. (2012) and is shown in Figure 1. Observing resolved objects with DSSI at Gemini is discussed in Howell et al. (2012), where the authors produce two-dimensional reconstructed images of the Pluto/Charon system. 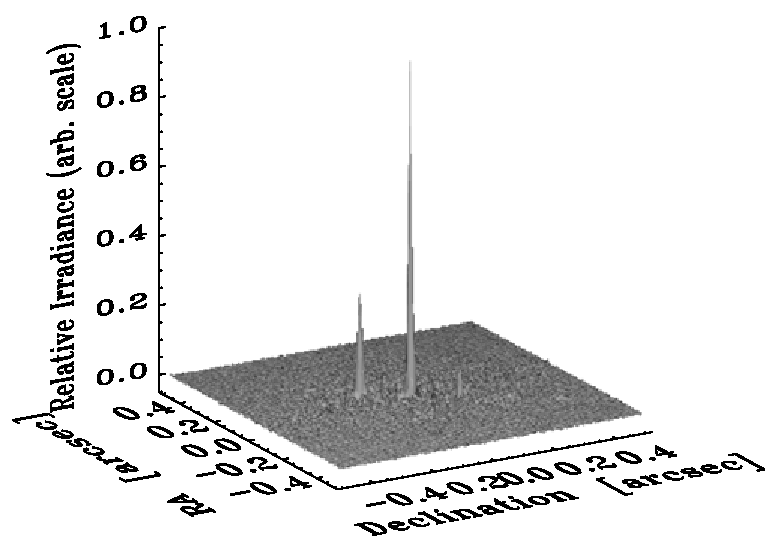 The DSSI photometric precision is ~0.1 mag in R and ~0.2 mag in I at R~14 (Horch et al., 2012). Example #1: Observing a V=11 star with a V=16 companion with a separation of 0.1 arcsecond. Astrometry: The astrometric accuracy of faint companions is ~2.5 mas on each 60ms x 1000 frame integration (combining data from both channels). Six 60ms x 1000 frame integrations would yield an astrometric accuracy of ~1 mas. Photometry: The photometric accuracy of a single 60ms x 1000 frame integration at a delta-m of 5 is about 0.25 magnitudes. Five 60ms x 1000 frame integrations would yield a photometric accuracy of ~0.1 magnitude. Example #2: Observing a V=12 star with a possible companion. Using a single set of 60ms x 1000 frames will yield a S/N of ~80 on the primary star. At 0.1 arcseconds from the primary the noise will be ~ 1 / 80 that of the primary. Therefore, the 5-sigma detection limit for a possible companion is 5 / 80 ~ 3 magnitudes fainter than the primary at a distance of 0.1". Using 15 sets of 60ms x 1000 frames (blue line in Figure 1) will yield a S/N of ~80 x sqrt(15) ~ 290 on the primary star, and the 3-sigma detection limit at 0.1" will be ~ 3 / 310 ~ 5 magnitudes fainter than the primary (contrast ~0.01). Table 1. Recommended point-source integration times and the total time to request when using the 256 (2.8 arcsecond) ROI. These integrations should yield S/N~80 compared to the background measured at 0.1" from the primary. Figure 1. 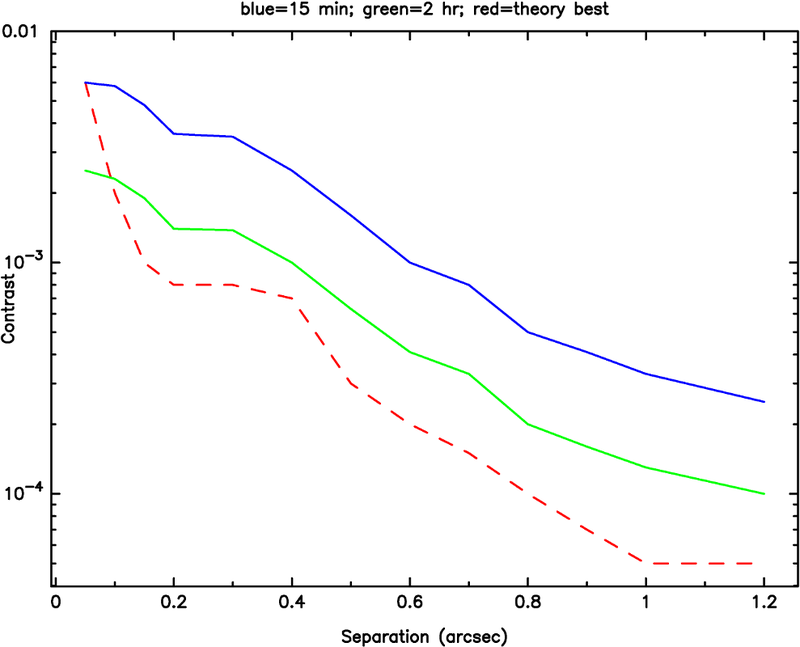 3-sigma contrast curves for 15 minute (on-source, blue) and 2-hour (on-source, green) speckle observations of a star observed with DSSI on Gemini, and the theoretical best visible light results for an 8-m telescope in space (red). The 2-hour line is comparable to the Hubble Space Telescope. Figure 2. Reconstructed image of KOI 98AB observed with DSSI on Gemini with a single 60ms x 1000 frame integration (Horch et al., 2012). The primary has V=12.00 and the secondary has V=12.68.